Tea lady, 88, retires after 52 years Jump to media player After more that 50 years of service, the tea lady at Newcastle United has decided to retire. 'Geordie Haka' video goes viral Jump to media player A Geordie version of the New Zealand rugby team's famous Haka has become an internet sensation. Sudan's tea ladies face tougher laws Jump to media player Thousands of women in Sudan who fled conflict in Darfur and South Kordofan and are now surviving by selling tea on the streets of the capital Khartoum are facing increased pressure as the government cracks down on unregulated businesses. The cost of watching women's football Jump to media player BBC Sport takes a look at the cost of watching games in the Women's Super League as part of its 2013 Price of Football study. 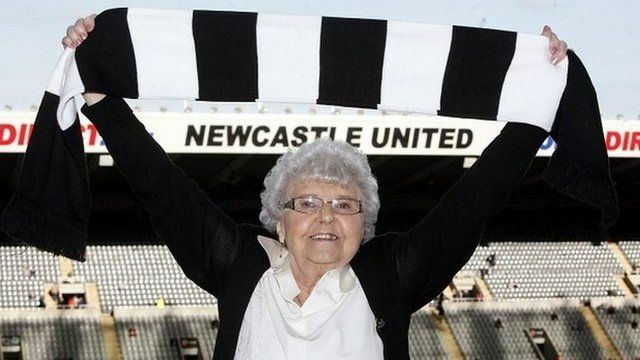 After more than 50 years of service, the tea lady at Newcastle United has decided to retire. Kath Cassidy, who is 88, has served up hot drinks to players, managers and journalists at St James' Park since 1963. To celebrate her retirement, she was a special guest at the club's game on Sunday against Norwich.